UNT adds to state-of-the-art facilities that set the course for learning. Bob Lynch (’49) remembers a great 1949 and a long career in yearbooks. UNT honored Fort Hood shooting victims and first-responders at its Nov. 21 game against Army. Alumni of nationally ranked program fill city management positions in Texas and beyond. How do you create positive family traditions during the holidays? UNT students dedicate hundreds of volunteer hours as part of the MLK Year of Service. Perseverance and a healthy work ethic take alumna all the way to Capitol Hill. Filmmaker Guillermo Arriaga, UNT artist-in-residence, discusses the art of acting. Alumni, students and visitors celebrate Mean Green history and tradition. My husband and I came across two UNT alumni on a hike through the Rockies. 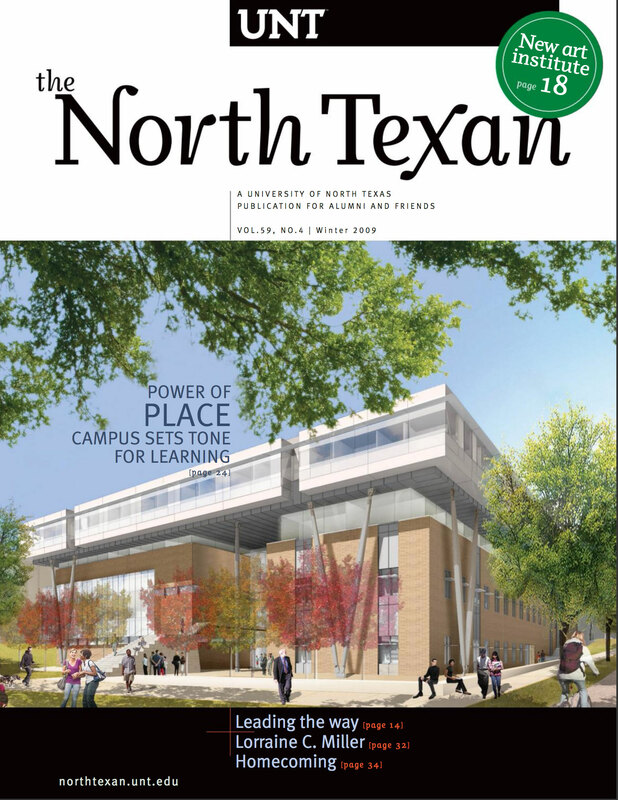 The directory will be filled with prominent UNT personalities and school history. Every advancement we make builds our reputation and improves the value of every UNT degree. Your article on President J.C. Matthews reminded me of the “15 minutes of fame” I had with him. The 30,000-seat stadium will be the centerpiece of UNT's Mean Green Village. Members of the J.C. Matthews family were honored with inaugural award. Students donate to UNT after participating in annual phone-a-thon. Mean Green head coach John Hedlund earns 200th career win; RTVF students earn Lone Star EMMY awards. Professor of music and internationally renowned tenor Richard Croft performs at Versailles. Campus radio station KNTU celebrates 40th anniversary. UNT alumna Carla Moreno finds voice as member of MusicianCorps. UNT interior design senior Stephen Walsh's executive office suite took first place. UNT aluman Blythe Beck is at the center of a hit Oxygen network reality series. The third biennial conference, with participation across disciplines, will focus on rivers. UNT alumna Helen Denman Beauchamp has earned more than 100 gold medals in the Senior Olympics. A new institute opens gallery, welcomes Oscar-nominated writer and names faculty fellows. Students remember journalism teacher Barbara Colgrove and her creative teaching methods.